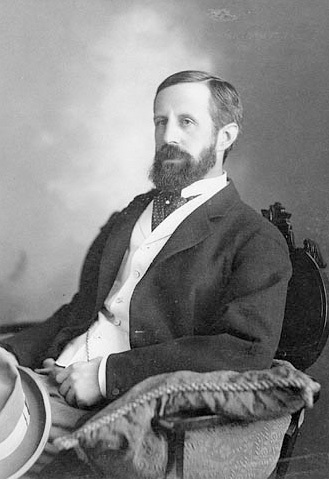 Frederick Charles Denison, and his wife Julia Abigail, purchased 'crown land' from Her Majesty, Queen Victoria (according to the deed) in 1883. 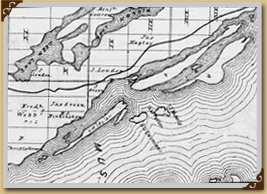 We (the committee) suspect that the land purchased was the parcel presently known as "The Bay", since it was smaller and far less expensive than future purchases. Four years later, in 1887, FCD purchased his remaining holdings, "The Point", from a gentleman named Moberly on Montcalm Point. A number of years later, 1889, Esther Borden Denison, or Aunt Hettie (sister to FCD) bought the east parcel of Beachgrove (Agiochook) from the same Mr. Moberly. 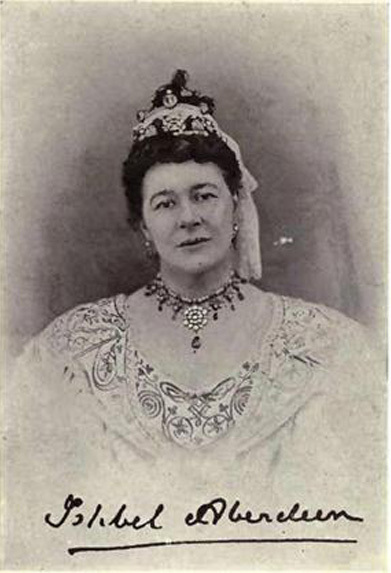 Since Esther was unmarried, and left no issue, she bequeathed Agiochook to her niece (Septimus Augustus Denison's daughter) Maud Esther Borden (Denison) Bowman (Judy's grandmother). In 1955, Esther deeded the now called "Oak Ridge" section of her property to her daughter, Anne Elizabeth Fraser (Bowman) Cherrington. She left instructions that after her death...she died in 1966...that the remaining section of her property be left to her son Stephen Bowman's first child, Sarah (Bowman) Daigle. 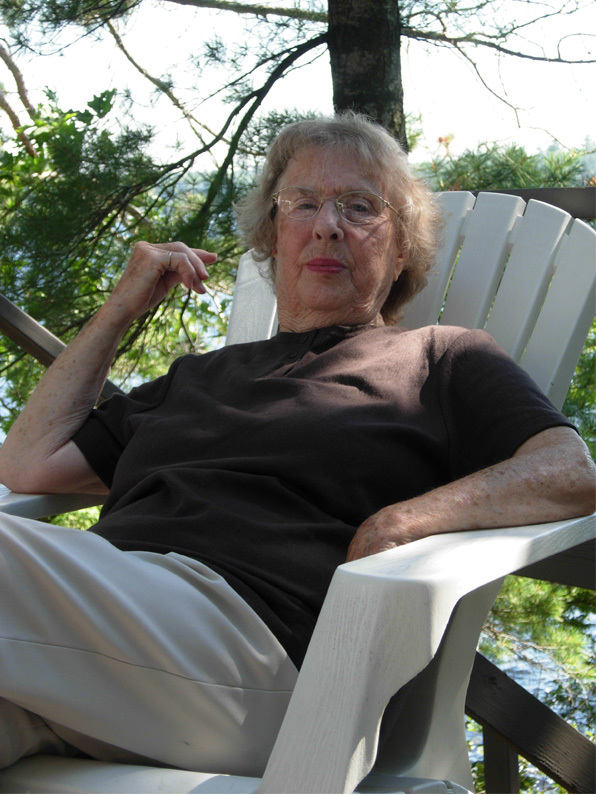 When Anne Cherrington died in 1983, she left her property to Judith Louise Cherrington. FCD died in 1896, at which time his wife Julia Abigail (Macklem) Denison, became sole owner. 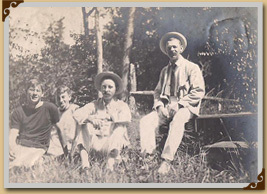 Upon her death in 1943, she left portions of her property to her three youngest children, Dora Louise (Denison) Wright, Gordon Cyril Denison, and Egerton Boyer Denison. 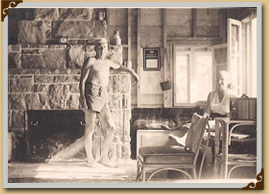 Gordon began construction on his new cottage at 'The Point' and moved there in 1946, sometime after his mother Julia's death he bought out his two siblings. He then owned his 1/2 of Beachgrove exclusively. (Uncle) Gordon divided his portion of Beachgrove, and upon his death, in 1977, left "The Bay" to Charles Edmond Wright and "The Point" to Gordon Denison Wright. Upon Gordon Wright's death, in 1993, his wife Elizabeth Gwendolyn (McElmon), became the owner of "The Point". One third of The Point was given to Susan (Wright) Ashley. (Uncle) Charlie died in 1977, Edith Louise (Parker) Wright, his wife, took over ownership until she died in 1998, when three of her children inherited "The Bay", Stephanie Louise (Wright) Dempster, Leslie Anne (Wright) Feddery and Robert William Gordon Wright. 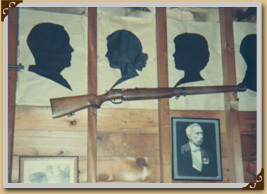 As I know everyone remembers, the "big dining room" at our Point had silhouettes up on the wall around the room. 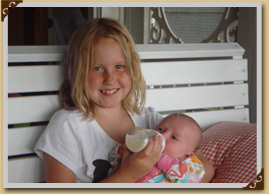 That tradition began when the Governor General of Canada was coming to visit. The tradition continued for many, many years. The person whose silhouette was put up had to have spent at least one night there. In addition to family members, other silhouettes included Ada MacKenzie (Canadian golfist) and Hume Cronyn (actor). Silhouettes were also done of various dogs and cats…I certainly don't know how they accomplished that! 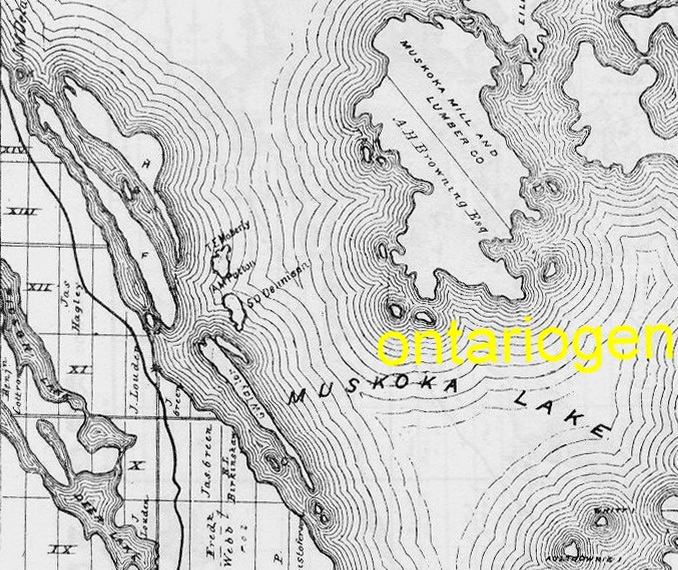 Read an excerpt from Septimus Denison's published memoirs about Lake Muskoka. They say that a picture is worth a thousand words, but memories from childhood evoke the warm and fuzzy feelings that remain forever. 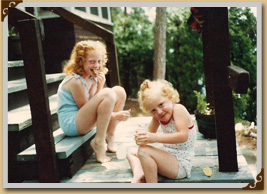 I remember the thrill my sister and I got from the prospect of taking the double ended row boat out the first time alone to dump the cans. The idea of dumping garbage in the lake today is unthinkable, but back in the "black and white days", as my kids refer to the '50's, it was acceptable. 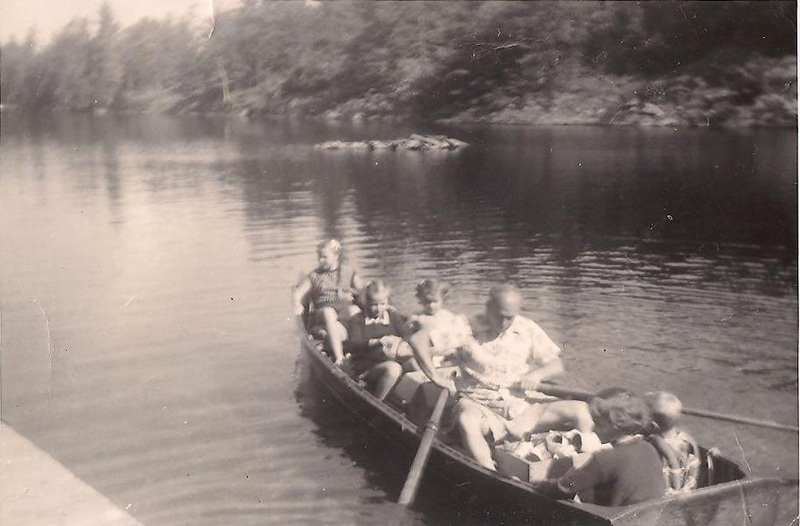 Nancy and I would row our way to Granny & Uncle Gordon's, taking our time to look over the edge of the boat to find golf balls, old plates and other treasures at the bottom of the bay, which had probably been dumped by previous generations. After collecting the elders' meager bits and pieces, destined for the bottom of the lake, we continued our journey way past Bowman's point near Fisherman's Island. We were told emphatically to row way out beyond the island, so that our 'offerings' would not eventually make it back to shore. I recollect the thrill that we got watching broken pieces of glass, plates, vegetable cans from yesterday's dinner, unrecognizable scraps of metal, all slowly descending to the depths of pristine Lake Muskoka. Recalling this now makes me feel rather guilty, but who am I kidding, it was a good morning's work, and we loved going on such an adventure. As the human population grows on Beachgrove Island, so does the four legged kind. I am not referring to the numerous dogs that consider themselves family, but the wild animals that have increasingly been spotted much to the pleasure or dismay of the island inhabitants. 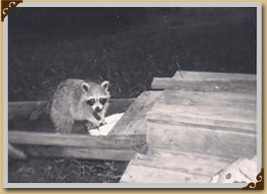 Chipmunks, red squirrels, raccoons, a rafter of wild turkeys, pheasants, otters, minks, and the occasional beaver, have become familiar and are often taken for granted. They are either a nuisance or a delight. 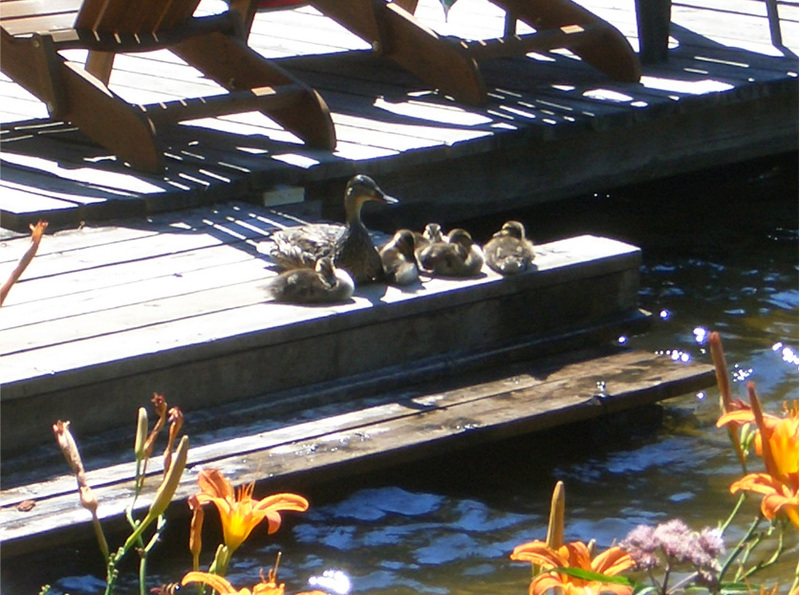 Resident mallard, Ping is frequently spotted looking for handouts, or parading her offspring for all to enjoy. But recently we have encountered more intimidating animals. 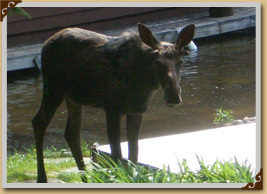 Three years ago it was twin yearling Moose, recently set free by their mother. 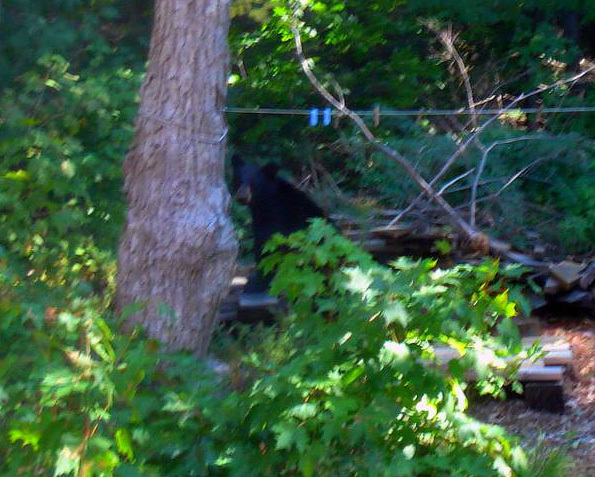 Two years ago a young black bear, only interested in raiding compost piles. 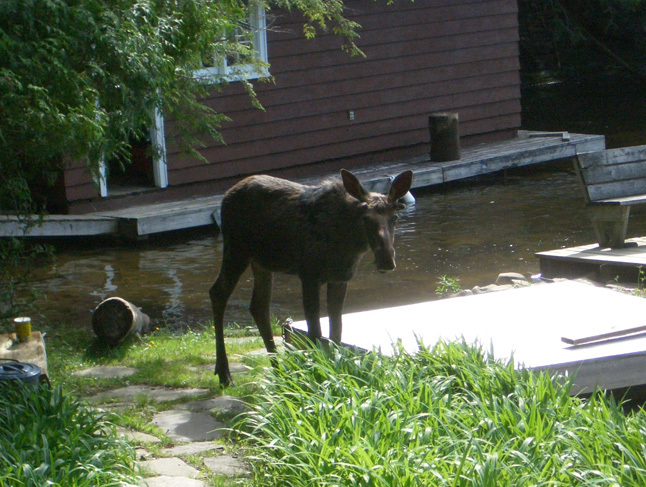 "Maurice" or "Morris" the Moose entertained all of us daily, as he searched for what little edible plants he could find. 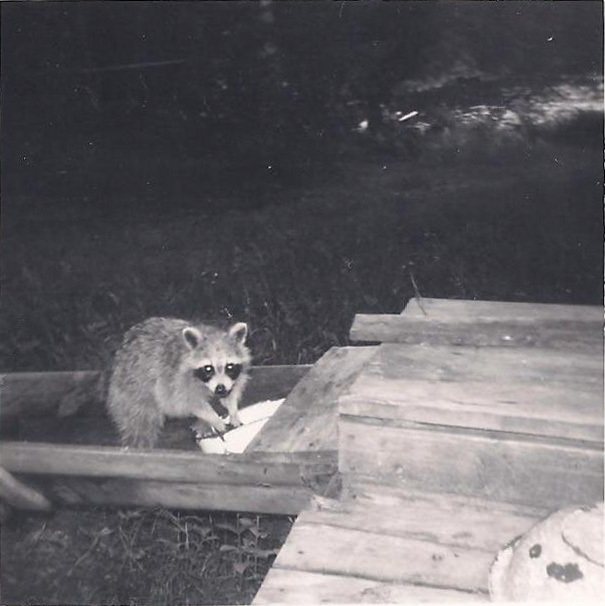 He was often encouraged to leave by banging pots, blowing whistles, or shooting marbles at him with slingshots, but his decision to stay was based on how much food he could find, and as Tookie will attest, he planned to stay until all of her Muskoka lilies were devoured. The Bay - Sunday swimming party with Laws. Fred, Ruth and kids came in Sponson canoe and their dogs swam over via Hayden and into south bay. Now we have VB games at any excuse as long as there enough bodies. Various combinations: youth vs aged, blood and non-blood, bay vs others, girls vs guys. Younger kids are included and paired beside a "teaching" adult. They also get several chances at serving. There is still no TV but there is internet. Games and reading occupy the evenings. OTR - Pirate show is the main feature. Any visitors are given a costume and a supporting role in this weekly show. 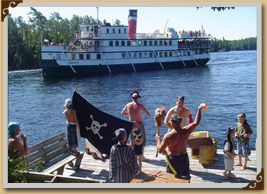 The 5 minute show is the same every week because the people on the Wenonah are different every week. This also helps the narrator to draw the audiences' eyes to what to look for. This year our youngest grandkids (ages 6 and 7) were forced to walk the plank. On the last show of the summer we did a role reversal and all the girls were pirates and the men were maidens. 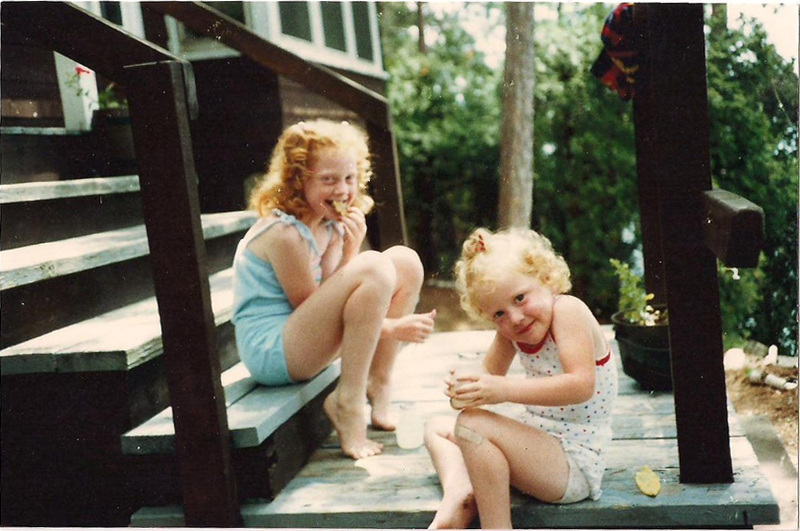 It wasn't until my mid-twenties that I realized just how lucky I was to have spent time every summer in Muskoka. When it is something you do year after year, you don't think twice about it. 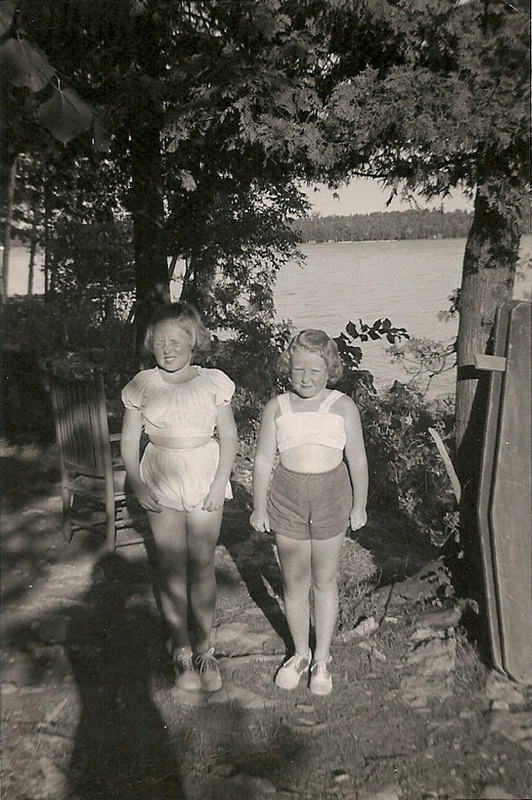 When we were younger, my parents would pack up the car, throw us in, and away we'd go. Back then a two hour drive felt like FOREVER! This was long before travelling DVD players and Nintendo games were available. We were forced to make our own fun while we were stuck in traffic on the 400. As we snacked on red licorice (a treat reserved only for the cottage) we would play games that included humdinger, thumb war, and the blinking game. The drive up to the cottage was never measured in hours, but in "Sesame Streets." When my younger sister would ask, "How much longer?" My parents would reply, "one and a half more Sesame Streets." We really had no clue what that meant, other than the fact that one Sesame Street was still a long way away. After stopping for dinner, gas, and pee breaks, we would finally arrive in the town of Gravenhurst. As our car sailed under the big Gravenhurst sign, my dad would roll down the car windows and state, "I love the smell of Muskoka air." 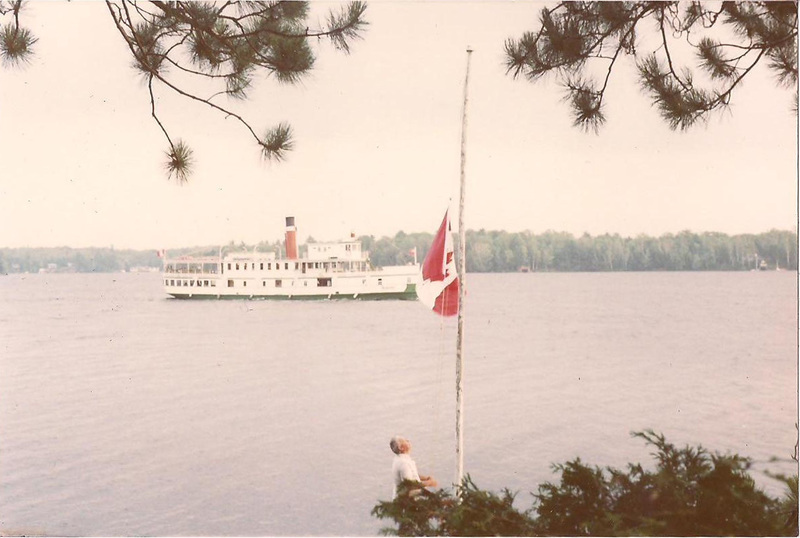 While I was trying to come up with a favourite memory of Muskoka and spending time on Beachgrove Island, I realized that the common theme to any memory is the feeling of freedom. There is something quite magical about Muskoka, and that feeling starts as soon as my house disappears from my rearview mirror. 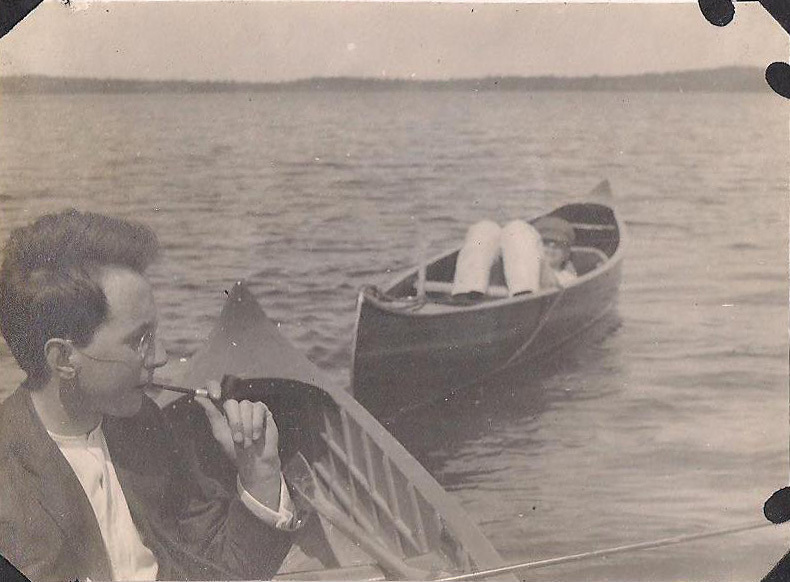 The freedom to do what you want, when you want because hey - you are at the cottage. There are no rules to follow, no time restrictions, everyone just goes with the flow and does what tickles their fancy. If it means having a dance party at 2:00 am then so be it. If it means sitting on the dock while sipping coffee at sunrise - then more power to you. Muskoka is freedom. In the beginning there was no electricity on Beachgrove Island. We used lamps, lanterns and candles for light. The eyes got used to these things as our parents did long ago. We did our work, reading and cards using them. We all looked beautiful under that dim light. Our flaws were hidden. 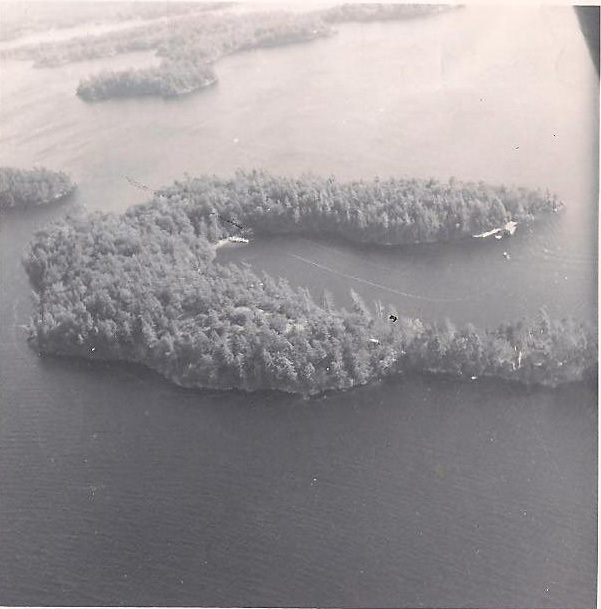 In about 1973 Uncle Gordon Denison paid to have the hydro put on the island. It was under the lake from one of the islands. He was the one who paid the bill and the hydro went over to Bowman's, who paid after I do not know, no poles, only 1 was on our side of the land near the cottage. Granny (Dora) in the morning got on her dressing gown, then made the wood stove fire and boiled water for porridge while boiling water she went for a 'dip' in the water (bathing beach). Walked back to the kitchen, made porridge, called Gordon (Uncle) and had breakfast. Gordon and I never bought worms for fishing. He taught me to go 'worming'. One takes a flashlight and with bare feet, after a rain, proceeds to go out and quietly walk along and see the worms on top of the ground and quickly pull them out (if you are quick enough) Lots of worms were found by also turning over old stones, logs and boards. The flashlight helps one to see them. wood stove from Elmira stoveworks, which was referred to as Libby's "mink coat"
Uncle Gordon and Granny transporting the family sterling silver back and forth to Toronto. 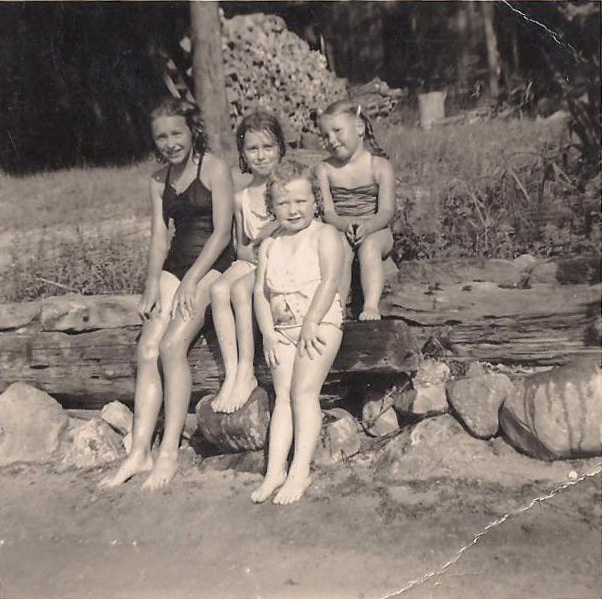 *These are all great memories from the eldest current owner, who has spent 65 years to date on Beachgrove Island, and will be celebrating her 90th in 2012. Early entries were just about the times of arrival of themselves and others, weather reports, birthdays and who died and got married in the summer, but as years went by she became more interested in the happenings of a growing family. Here are a few. Aug 6, 1960 "The regatta was today. The sailing race started at 10:45 at the gap, then to Tiffany Is. and then the buoy off Mont Calm Pt and back to the gap, so we could see it all from our front dock. Julia went in their little dingy. Jim was chairman, Steven went with Freddy and they came in first." Aug 9 '63 "Gordon and Libby and their 3 girls came up this morning at 10:30 for the regatta it was a lovely day not too hot except for the sun. 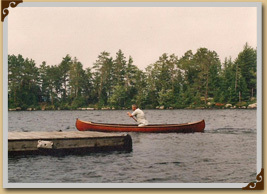 We had lunch, washed up and then towed the canoe behind the launch to Campbell's where Gordon and Nancy won the canoe race and then later those two won the around the island as well. Julia and Fred came in 2nd. We got home about 5 and I got dinner on the way with Libby's help. Gordon and family left at 8:45 a lovely day for them." 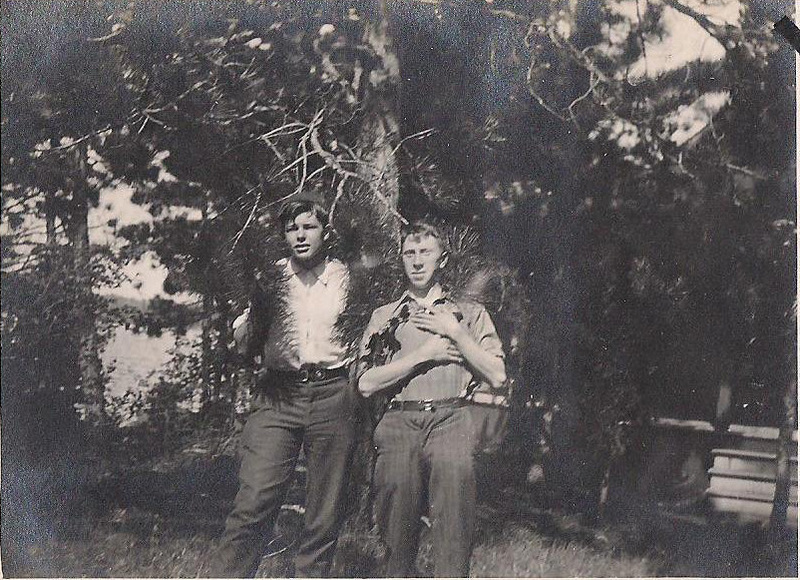 Aug 29 '61 "Ed Charrington came over this a.m. to ask if he could shoot a crow." 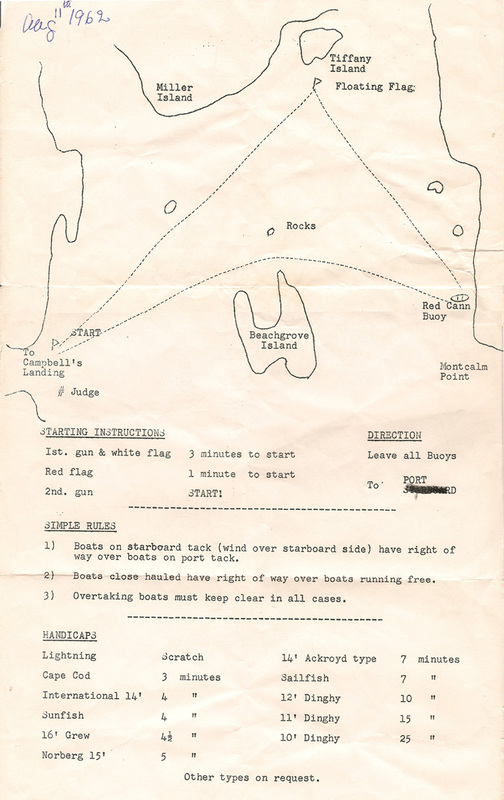 Aug 9 '64 "Gordon took Judy in the dinghy with him they came 7th and Charlie won the cup with the sunfish. 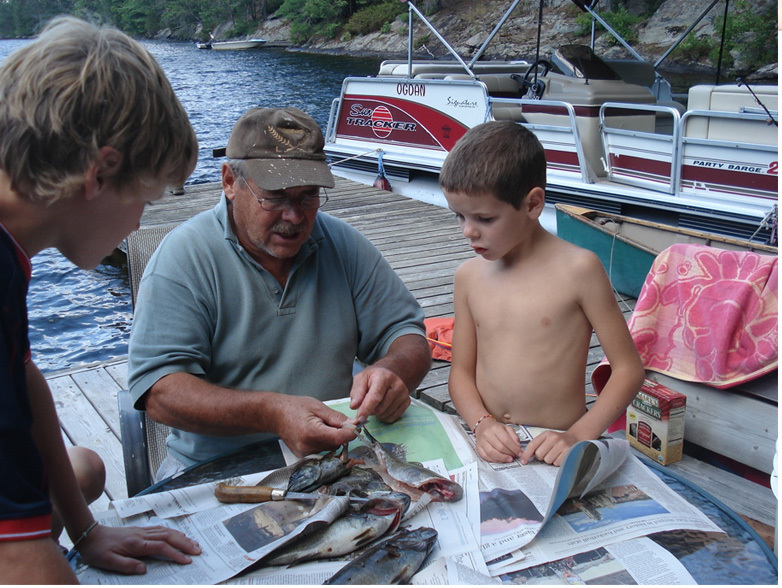 He had his son Roger with him, it was a very cold day"
Aug 18 '65 "Gordon and Libby for a sail and I caught a nice big fish about 14 in. long. Julia and Jim came in the evening for about 1/2 hr. 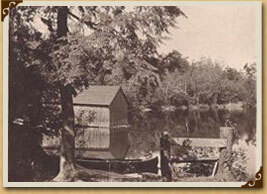 Gordon and Uncle Gordon went to Edgerton's in the evening to play crib." 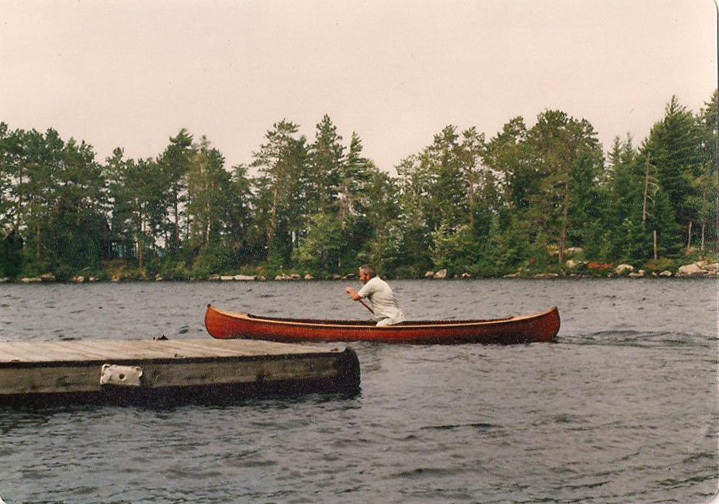 Aug 10 '73 "Uncle Gordon fell off dock walk. Is O.K." Aug 20 1973 was the last day granny spent on Beachgrove and she died Sept 28, 1974. 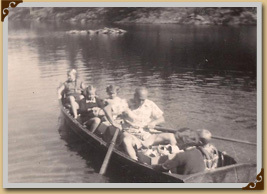 Uncle Gordon (Denison) who shared the cottage with sister Dora returned to Beachgrove the following year 1975, bought a new boat, a 16' Springbok 'ranger' and on July 20th and 27th., in his 90th year, went for another swim as he had each year enjoying summers at Beachgrove. 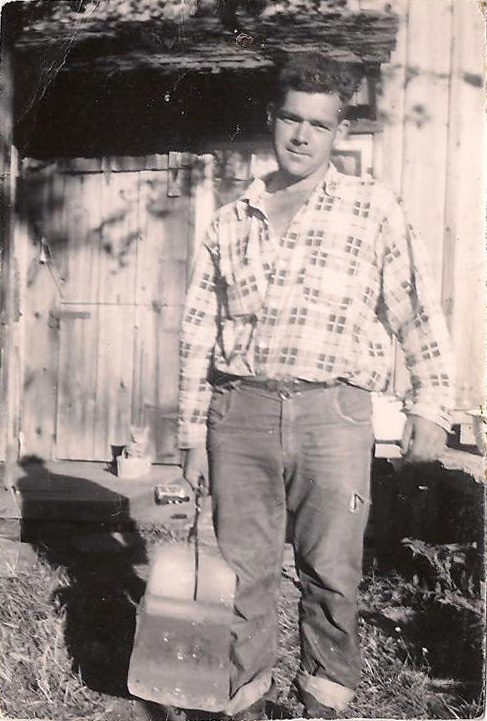 Uncle Gordon died Jan. 19,1977. The end of an era! 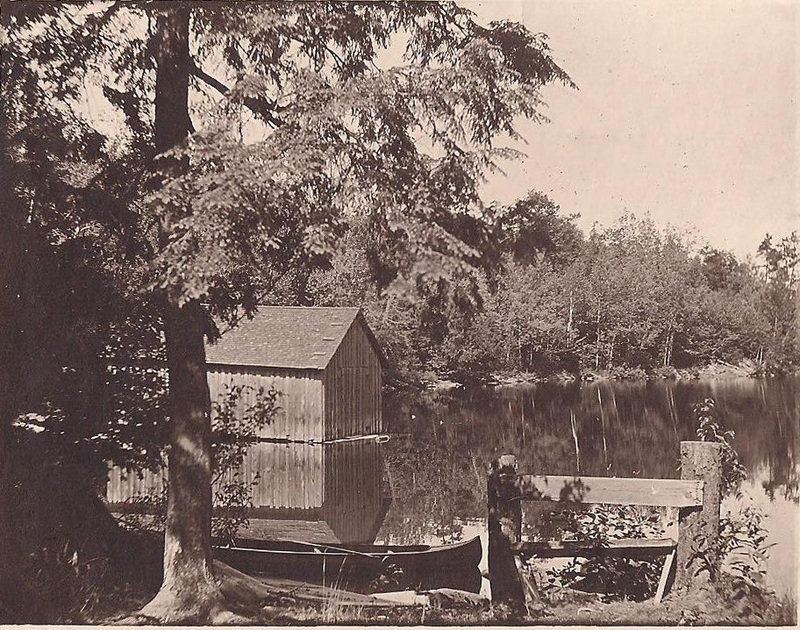 The old boathouse was taken down in 1955. The hardwood floors in the main room, her room and spare room (?) were laid in 1955 and Uncle Gordon sanded and finished them. What I love about Muskoka! I love that we always get to swim because it is so much fun! I love spending time with my family and playing cards! I love playing with my family and my sisters and we love going on the swing! 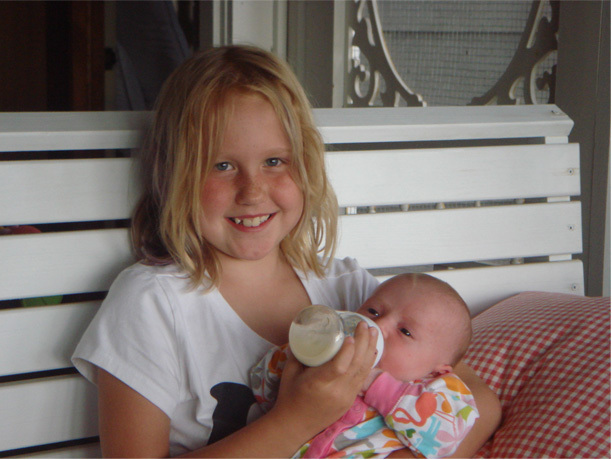 My sisters and I when we go on the fast boat it is so much fun and when we go on the party boat we love it. But the little boat we don't really go on it. It is so much fun when we go down to the bay to see our cousins and dogs. 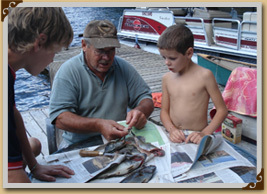 My family and I go fishing on the front doc but I don't like putting on the worms and I don't like touching the fish! opening the door to Granny's kitchen... to the wonderful smell of fresh bread and seeing covered bread rising on the table, wood stovetop and all the counters. the 'elders' teaching us to play cribbage and bridge... they usually beat us but we came back every evening to try again! 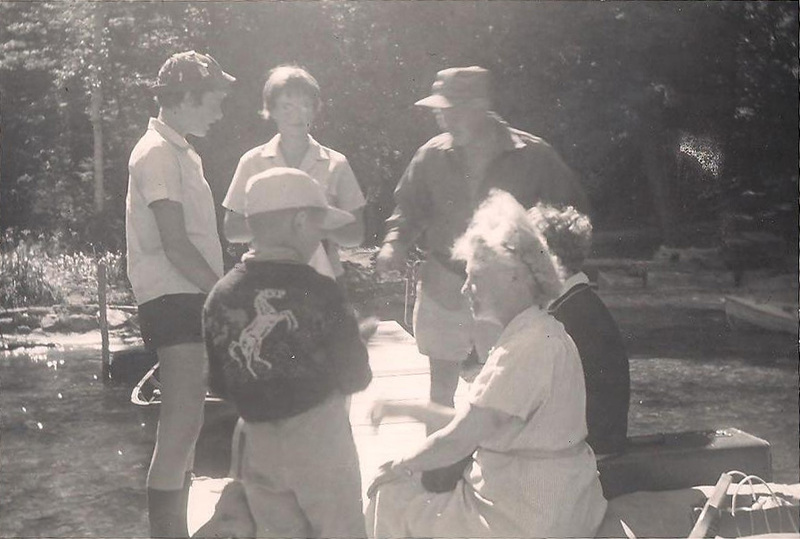 Beachgrove Island has always been a special place in the hearts of those family members who have been lucky enough to recall fleeting childhood memories of hot summer days, an enjoyable weekend with friends and family, or a few weeks of holiday from a demanding job. But if you are like some of us, who are fortunate enough to spend their summer entrenched in the pleasures of summer living, you count yourself lucky; lucky to be born into this family, or lucky enough to have a partner that was. Having guests come to stay has long been the standing norm as far back as our Great Grandparents days. This is apparent from viewing the nameless faces and unidentified images from the old photo albums that we all seem to have in our possession. There were a few notable guests, however, that are interesting enough to be worth mentioning. A young friend of Egerton Denison, named Phillip Garratt, was a longstanding guest of the Denisons on Beachgrove. 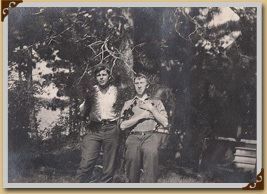 Both Phillip, his mother Mrs. Garratt (no first name indicated) and their dog Rex, showed up in many photos between 1914 and 1937. 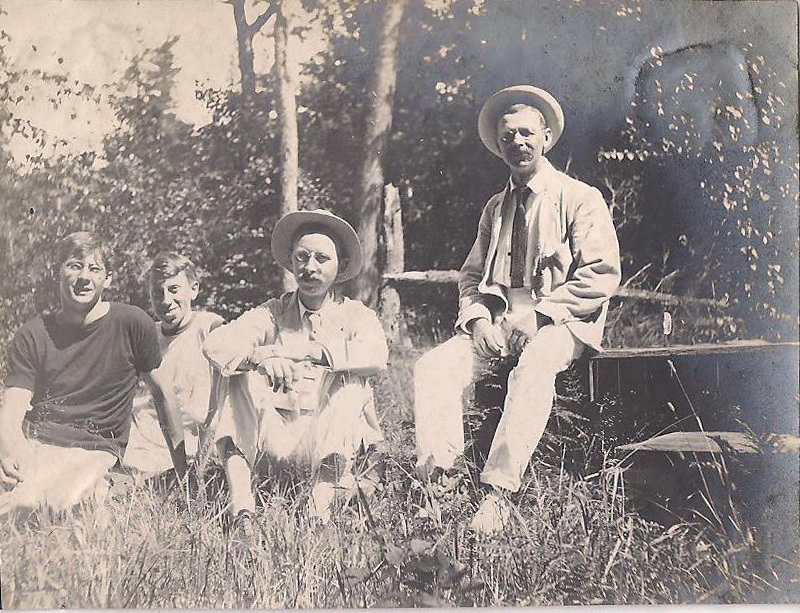 The photos show a young Garratt with friends Egerton Denison, and Adrian Wright (brother to Alfred and Sir Charles Wright) canoeing and 'hanging out' as friends. 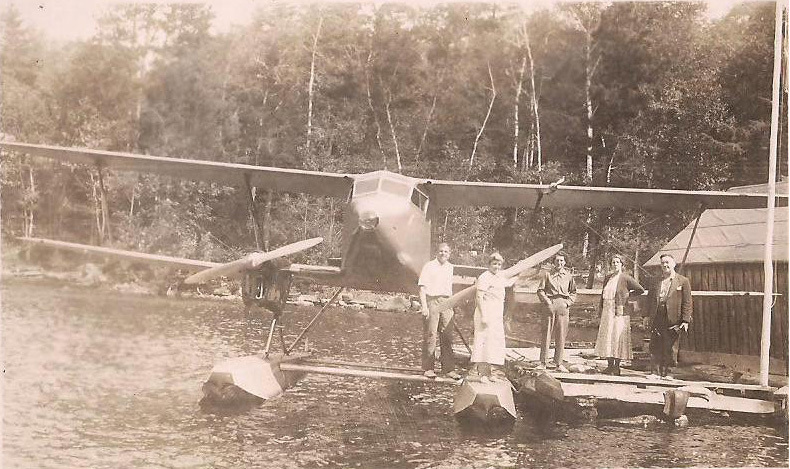 He and his wife arrived for a visit via his sea plane 'Dragon Fly' in 1937, which was towed by rowboat from the mouth of the Bay to the dock. Phillip Garratt was born in 1894, in Toronto. 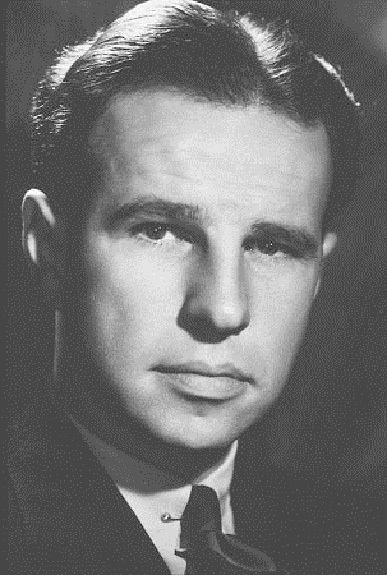 He was inducted into the Canadian Aviation Hall of Fame in 1974. 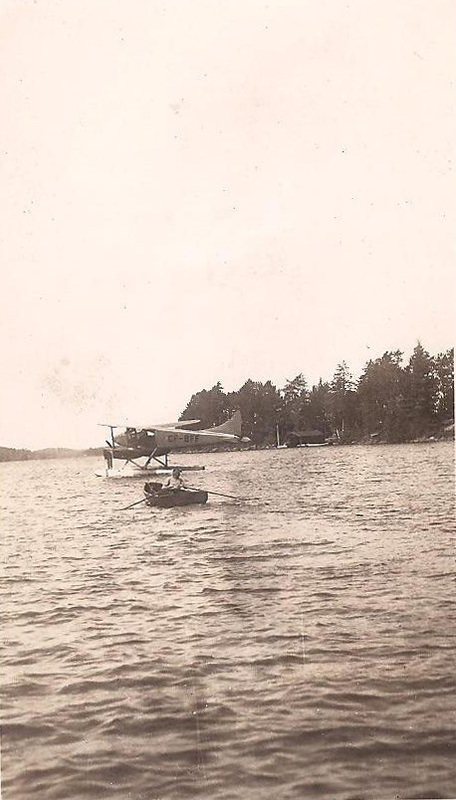 "His fathering of a series of short takeoff and landing aircraft, each of which gained world-wide acceptance, has been of outstanding benefit to Canadian aviation." Phillip attended the University of Toronto and in 1915 undertook basic training with the Curtiss Aviation School. He earned his pilot's wings with the Royal Flying Corps a year later in England. A fighter pilot with No. 70 Squadron, RFC in France, he later became an instructor at the Gosport Flying School in England. 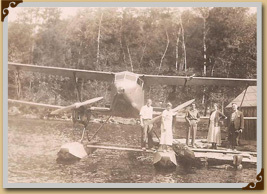 After the war, Garratt joined the de Havilland Aircraft Company and was quick to open Canada's northland for the exploration and development of natural resources. It was also with this firm that he concentrated on modifying the designs on such STOL aircraft as the Otter, Caribou, Buffalo and Twin Otter. After WWII, he fostered development of the Chipmunk trainer and a series of successful STOL aircraft, including the Beaver and Otter. 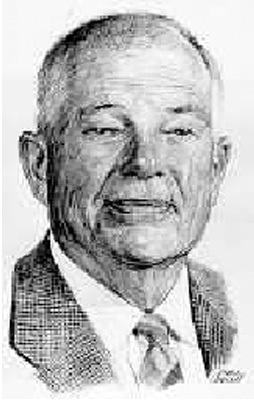 He was awarded the McKee Trophy in 1951 and 1966. By increasing the plant's workforce to 7,000, he also managed to produce more than 1000 Mosquito fighter-bombers and assembled 375 Avro Anson aircraft. He died in 1974. Sir Charles Seymour (Silas) Wright K.C.B. C.B. O.B.E. M.C. B.A. M.A. 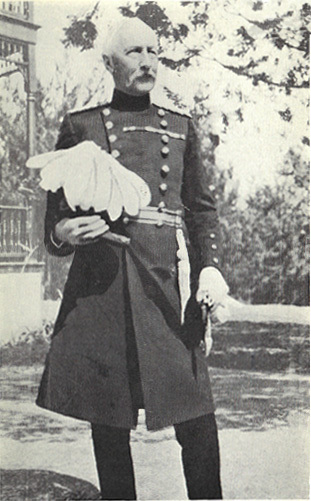 D.Sc was, brother-in-law of Dora Denison. 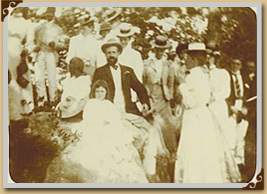 His association with the Denison family went back to the time of Dora and her husband Alfred's marriage in 1910. 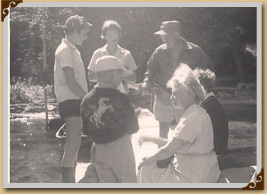 Charles and his brother Adrian were frequent visitors to the island as young men when Dora and Alfred were in residence. Later in life Sir Charles and his wife Lady Edith visited the Point on many occasions, and like Phillip Garratt arrived by seaplane, a rarity at the time. On one of these visits "Marys Point" was named for Lady Edith, due to her preference for viewing the sunset from the most westerly view at 'The Point'. 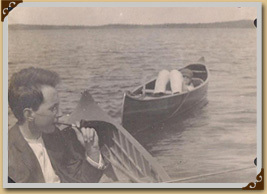 Charles Wright, or Silas, as he was called, spent his youth prospecting in Canada's Far North. While in Cambridge, England, on a physics scholarship, he heard of an expedition being put together by Robert Falcon Scott, to reach the geographic South Pole. Silas and fellow student, Australian geologist, Griffith Taylor walked from Cambridge to London to apply for positions on the expedition and were soon on board the Terra Nova, heading for Antarctica. During his time in Antarctica, Silas carried out numerous experiments on ice formations and ground radiation and had hoped to be included in the final party selected to accompany Scott on the final dash to the South Pole. Silas was turned back by Scott a few hundred miles from the pole and navigated his depot-laying party back to Cape Evans, where they awaited Scott and his party's return from the pole. By the next spring it was obvious Scott had met with disaster and Silas navigated for the main search party retracing Scott's steps and was the one who discovered the tent containing the frozen bodies of Scott, Wilson and Bowers. Silas returned to England, where he and Taylor each married a sister of fellow expedition member, Raymond Priestley. Silas went on to a prestigious and varied career: developing trench wireless in WWI and was active in the British Admiralty during WWII, including developing devices to counter magnetic mines and radar. He was knighted for his contributions in 1946. 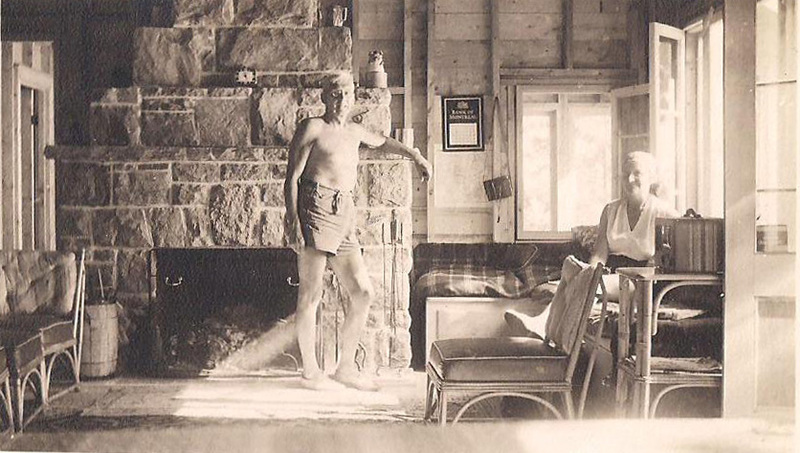 After the war, Silas moved to the United States, becoming director of the Marine Research Laboratory at Scripps Institute of Oceanography and various assignments for the US and Canadian navy. 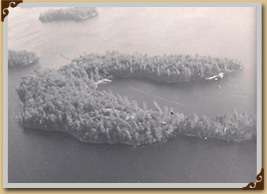 Silas retired to Saltspring Island, BC, where he passed away in 1975. 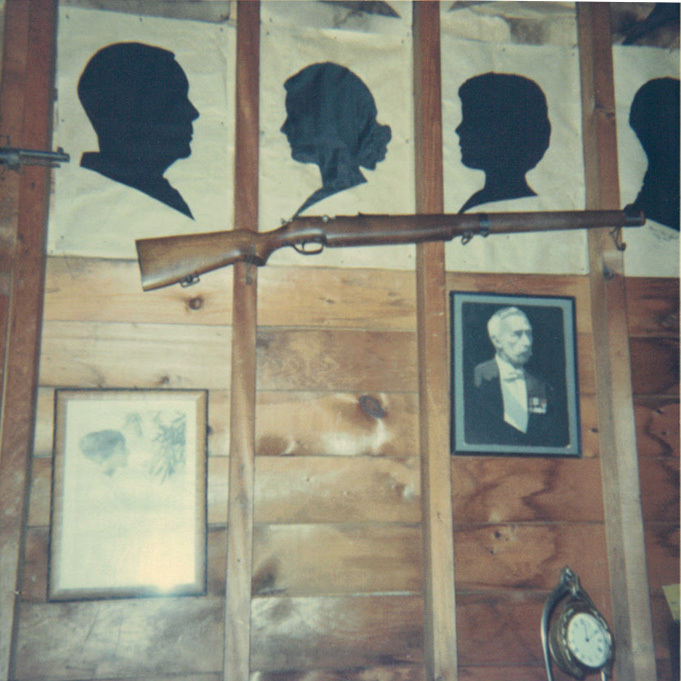 Ada Mackenzie's silhouette hung in the Big Dining Room at Agiochook until the 1990's, which indicated that she was an overnight guest at the cottage while the Denisons were in residence. 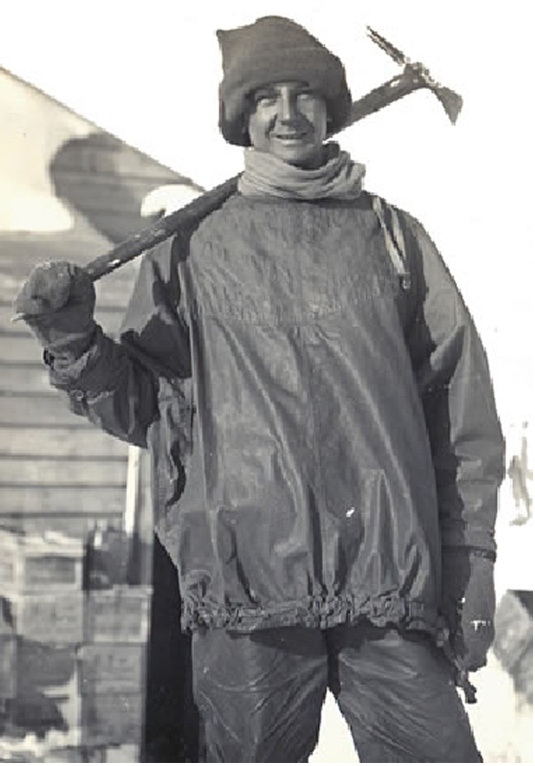 Ada Charlotte Mackenzie was born in Toronto in 1891. Her father was a fervent golfer, as was her mother. 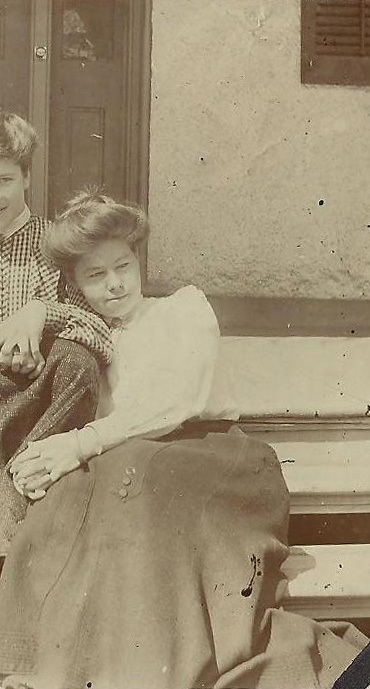 From 1903 to 1911, she attended Havergal College in Toronto, a stylish private school for girls. 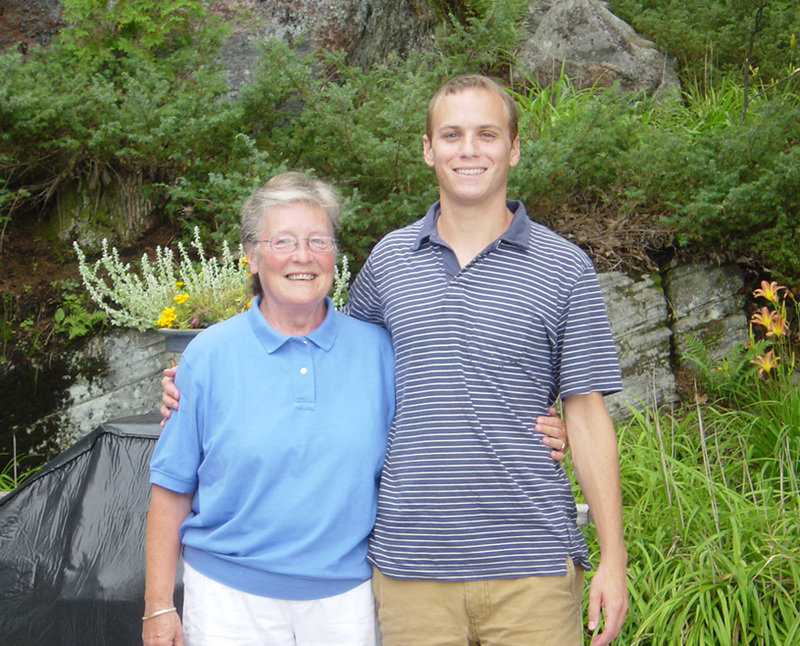 It was there that she discovered her passion for sports. She was a member of the cricket, basketball, tennis, hockey and figure-skating teams. 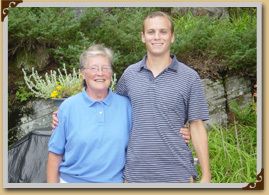 For three consecutive years, she captured the Havergal Cup, given to the College's Athlete of the Year. It is a record that still holds today. But golf was her first love and it was through this sport that she earned a reputation on the national and international scenes. In 1919, at the age of 27, Ada Mackenzie captured the first of her four Canadian "Open" Amateur Championships, and her six Canadian "Closed" Amateur Championships. The last of these victories occurred in 1931. She also captured the Canadian Women's Senior Association title eight times, the Ontario title nine times, the Ontario Senior title twice and the Toronto tournament 10 times. She placed second on 10 occasions at Canadian amateur tournaments. Throughout her career, Mackenzie captured a multitude of provincial tournaments, championships of private clubs and participated in competitions in the United States and Europe. One of her fondest memories is being invited to join the Scottish national team participating in the British Ladies' Open in 1929. In the 1920s, she was the dominant golfer on the Canadian scene. In 1933, she was named Female Athlete of the Year by the Canadian Press. Her career spans more than 50 years. She captured her last victory during the Ontario Senior Championships in 1969, at the age of 78. From 1911 to 1914, she was a sports instructor at Havergal College; from 1914 to 1930, she worked at the Canadian Bank of Commerce. 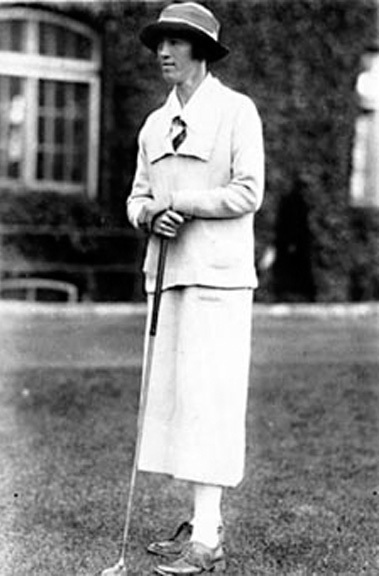 In order to assist young girls and women to play golf, she opened the Ladies' Golf and Tennis Club of Toronto in 1924. Only women were allowed to become members. Men could play there, but privileged hours and weekends, were reserved for women. Today, the Ladies' Golf Club of Toronto remains the only golf club in North America reserved for women. 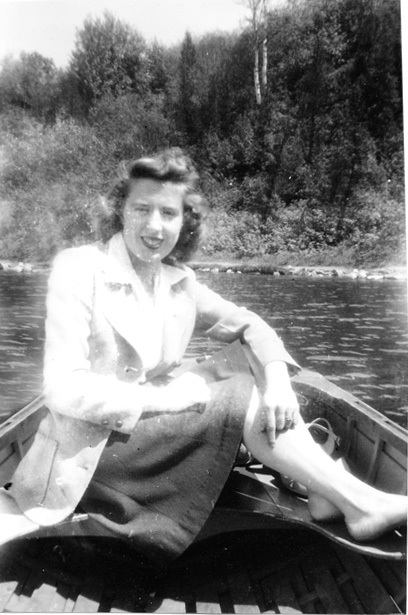 The second of her ventures in the business world was that of Ada Mackenzie Ltd., a boutique specializing in sports clothing, which opened in 1930. The daily management of this business kept her very busy until she decided to sell it in 1959. She died in January 1973, at the age of 81. In 1971, Mackenzie became a member of the Canadian Golf Hall of Fame where her brilliant record is proudly displayed in order to serve as an inspiration for new generations of Canadian golfers. Hume Cronyn's silhouette also hung in Agiochook. He was born in London Ontario, the son of a businessman and a MP for London. His grandfather Verschoyle Cronyn, was the son of the Right Reverend Benjamin Cronyn, an Anglican cleric who was the first bishop of the Anglican diocese of Huron, and founder of Huron College, from which grew the University of Western Ontario. He went to Ridley College and later McGill University. In 1934, he made his Broadway debut. His first Hollywood film was Alfred Hitchock's Shadow of a Doubt in which he was nominated for an Academy Award, for best supporting actor for his performance in The Seventh Crossand won a Tony for his performance opposite Richard Burton's, Hamlet in '64. In 1990 he won an Emmy for his role in the TV Movie, Age Old Friends. He married actress Jessica Tandy and remained married for 52 years until her death in 1998. In 1988, he was made an Officer of the Order of Canada. He died in 2003, aged 91. 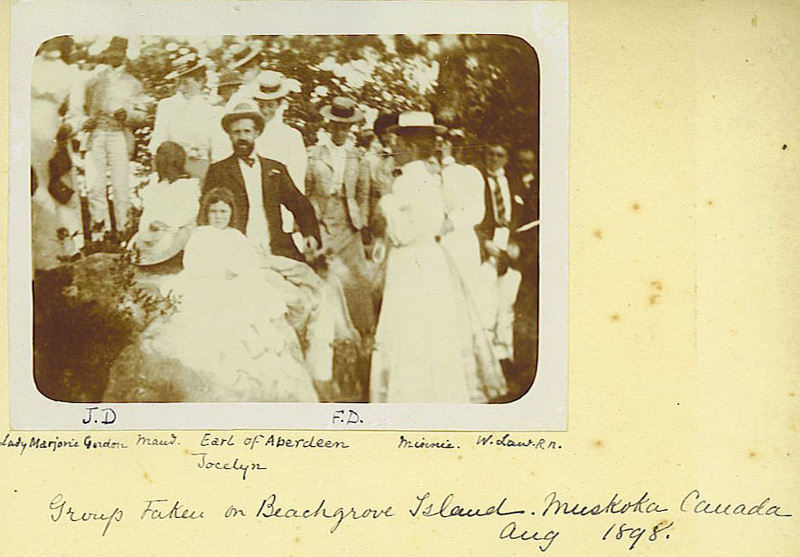 Lord & Lady Aberdeen were guests at a 'campfire' hosted by Septimus Denison on Beachgrove Island in 1898. 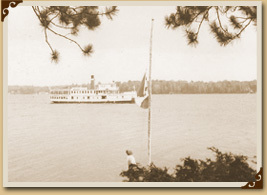 (see, History) Many other Muskoka Island inhabitants were in attendance that day and Lady Aberdeen was quoted to say, …"I must not omit reference to our visit to Major Denison at his Buckgrove Island (Beachgrove) a pretty place where he lives in patriarchal Muskoka Style"..
Lord John Campbell Hamilton Gordon Aberdeen, was the 50th Governor General of Canada, from 1893-1898. Aberdeen was born in Endinburgh. He succeeded as the 7th Earl of Aberdeen following the death of his eldest brother, George. In 1877 he married Ishbel Maria Marjoribanks. Lady Aberdeen, was a graduate of Queen's University, Kingston, Ontario with a Doctor of Law. She served as President of the International Council of Women, 1893-99. Lady Aberdeen founded the National Council of Women of Canada, and the Victorian Order of Nurses. He served as Governor General of Canada from 1893 to 1898 during a period of political transition. He traveled extensively throughout the country and is described as having "transformed the role of Governor General from that of the aristocrat representing the King or Queen in Canada to a symbol representing the interests of all citizens".